Generations of families love Geneva-on-the-Lake as a nostalgic summer resort when crowds stream down "The Strip", with its retro-style arcades, mom-and-pop shops and snack stands. Visitors during the rest of the year appreciate the quiet off-season as a great time to visit for a romantic retreat or weekend getaway in one of the country's premiere wine producing regions and covered bridge territory. We've visited this area, about 50 miles east of Cleveland, during the summer, but we especially enjoyed our most recent visit and stay at The Lodge at Geneva-on-the-Lake this autumn. The view from our second-floor room offered a panoramic view of Lake Erie, along with a bird's-eye-view of the lodge's dining patio and its pretty wedding gazebo. I'm remember thinking I wasn't surprised that many couples book outdoor weddings here to take advantage of the Lake Erie backdrop as I watched a photographer set up some shots the morning we were there. 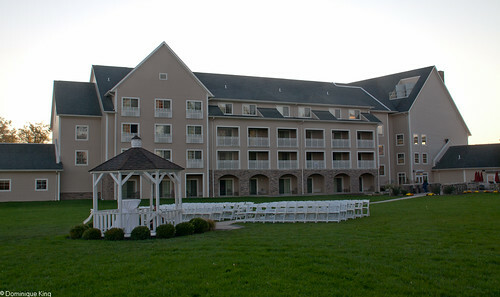 The Lodge, which is one of nine Ohio State Park resort lodges, has 109 guest rooms and suites, along with amenities like indoor and outdoor pools, hot tubs, a fitness center and game room, a few pet-friendly rooms, a guest coin laundry, a gift shop with a selection of Ohio-made products and local wine, and 8,500 square feet of meeting space seating up to 350 people in a banquet-style setting or 550 in a theater-style set up. Charging extra for online access seems to be a pet peeve among frequent travelers like travel writers and photographers. 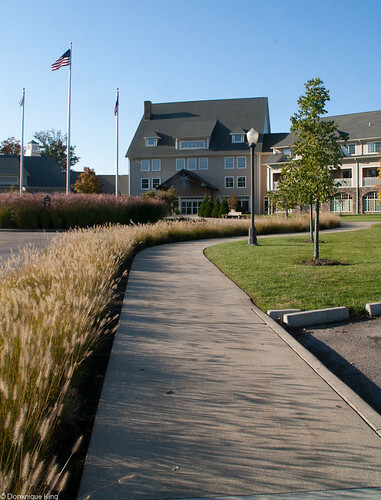 I've never understood why the other Ohio State Park resorts I visited previously for conferences charged an extra fee for online access, so I especially appreciated The Lodge at Geneva-on-the-Lake's free access to Wi-Fi and the Internet. 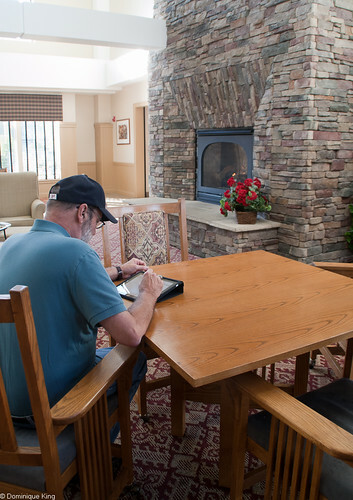 Visitors can connect from their room with a wired computer, or connect via Wi-Fi in several of the lodge's common areas like the soaring, four-story lobby with its huge stone fireplace. 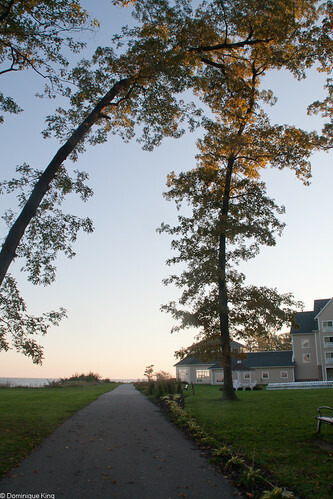 Among my favorite features of the Lodge, was the paved trail running along Lake Erie and to nearby Geneva State Park. We enjoyed walking and taking photos along the trail out to the park and its marina. I was tempted to rent one of the lodge's bicycles to take a ride along the trail, but we just didn't have the time to do so this visit. We did have time to enjoy dinner at the lodge's Horizons Restaurant. The restaurant, renovated earlier this year, is a great octagonal-shaped space with floor-to-ceiling windows overlooking Lake Erie and a central fireplace. The Lodge's Chef Russell Siegel offers a menu featuring Ohio-grown produce and products like the Ohio-bred steak Tim enjoyed that evening. I enjoyed my teriyaki-glazed salmon and the spicy calamari appetizer we shared at the table was a hit with us. Guests wishing to enjoy a glass of wine with dinner will find a variety of Ohio wines on the menu. Chef Siegel graduated from the Johnson & Wales College of Culinary Arts in Providence, Rhode Island, and worked at venues like the famous Pump Room and Soldier Field in Chicago, before joining the lodge's staff in March of 2011. We chatted with Chef Siegel after dinner about local sourcing and some of the special holiday themed meals, local wine and beer tastings, and culinary sessions he planned for lodge visitors. The restaurant's lounge is a nice place to enjoy an after-dinner drink and possibly some live entertainment, like the singer/guitarist entertaining guests the evening we were there. Guests can also have a bottle of local wine delivered to their room, like the lodge's signature Grand River Valley Riesling that awaited us in our own room. 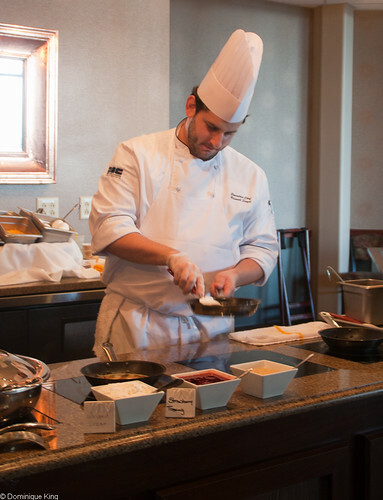 Horizons has a full breakfast menu and a breakfast buffet, where I caught up with Chef Siegel again as he prepared made-to-order omelets for guests. After a hearty breakfast, we were ready to check out some of Ashtabula County's 18 covered bridges and over 20 local wineries. 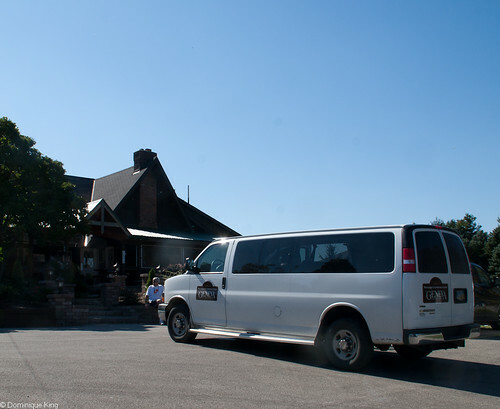 Those heading out for a day at the wineries can leave the driving to someone else by taking The Lodge's wine shuttle, which runs Wednesday through Sunday in the summer and Friday and Saturday during the fall. Guests can reserve their spot at $15 per person for the convenience of not worrying about driving or parking and being able to hop and off of the shuttle at a half-dozen different wineries. Come back later this week for more about our visit to the area wineries, or check out my previous stories about Ashtabula County's covered bridges. 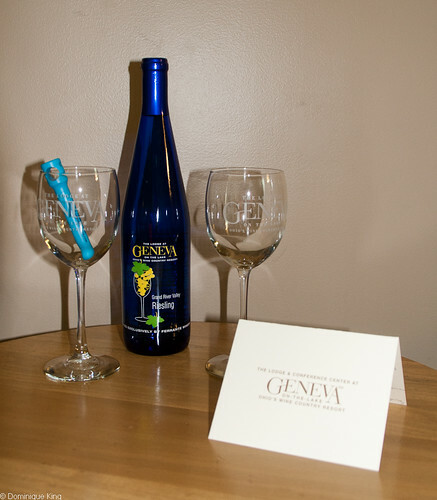 Want to learn more about the village of Geneva-on-the-Lake and the nearby city of Geneva? Check out Geneva (Images of America) by Susan Bradburn. Thanks to The Lodge at Geneva-on-the-Lake, which provided one night's lodging, dinner, breakfast and the in-room wine package for my review, with no further compensation. I was free to express my own opinion about our stay, and the opinions expressed here are mine.